A cutting-edge field-ready mobile solution on any phone, tablet or laptop. Field service technicians are always on the move—making mobile devices a logical extension to their everyday tools. All field personnel, including authorized service providers outside your organization, require greater visibility and access to critical service information on the go. 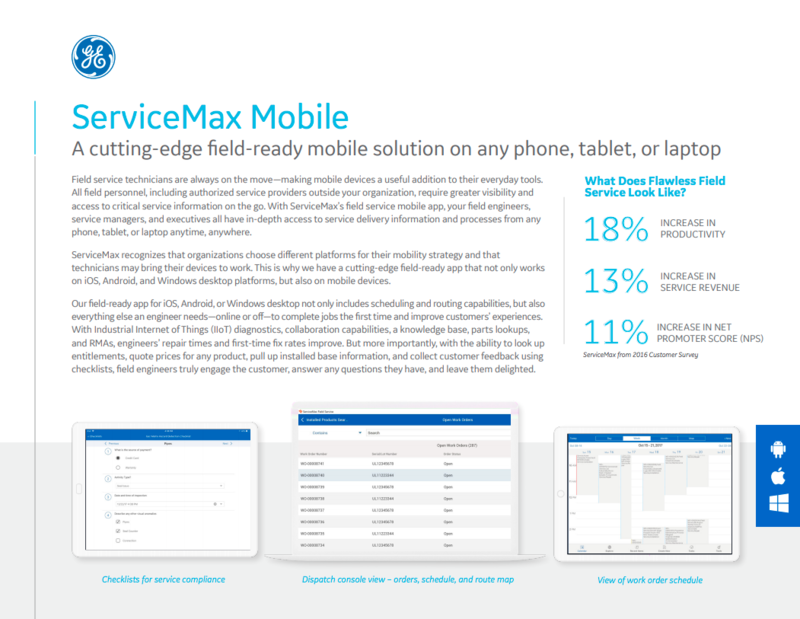 With ServiceMax’s field service mobile app, your field engineers, service managers, and executives all have in-depth access to service delivery information and processes from any phone, tablet or laptop anytime, anywhere. ServiceMax recognizes that organizations choose different platforms for their mobility strategy and technicians may bring their devices to work. This is why we have a cutting-edge field-ready app that not only works on iOS, Android and Windows Desktop platforms, but also on all form factors – mobile, tablet and laptop. ServiceMax field-ready app for iOS, Android or Windows Desktop not only includes scheduling and routing capabilities, but also everything else an engineer needs – online or off, to complete jobs the first time and improve customers’ experiences. With Industrial Internet of Things (IIoT) diagnostics, collaboration capabilities, a knowledge base, parts lookups, and RMAs, engineers’ repair times and first-time fix rates improve. But more importantly, with the ability to look up entitlements, quote prices for any product, pull up installed base information, and collect customer feedback using checklists, field engineers truly engage the customer, answer any questions they have and leave them delighted.